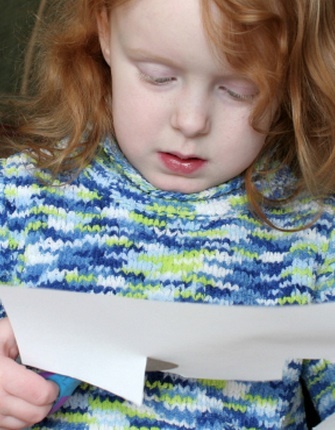 Are you teaching scissor skills to your preschool child? There’s more to teaching scissor skills than handing your child a pair of scissors and some paper. Scissor skills are considered a fine motor skill. Fine motor skills refer to hand dexterity and the ability to manipulate and control tools like utensils, pencils, crayons and scissors. Ideally toddlers and children learn fine motor skills in a step-by-step fashion. Each step builds on the previous step and is reinforced by practice. When it comes to learning to cut with scissors, most parents and teachers are at a loss where to start. The most common error is to start with the scissors themselves! It seems obvious that you cut with scissors, so you should start teaching how to cut…with scissors. But toddler and preschoolers actually need to learn, develop and practice grasp patterns, eye-hand coordination and muscle strength along with many other pre-cutting skills, well before they ever pick up scissors. Without a step-by-step plan to develop your toddler’s or preschooler’s fine motor skills, using scissors can be a frustrating process for a child to learn and for adults to teach. You can avoid this frustration for both you and your child and accelerate the learning process while having fun by following the simple steps and exercises involved in teaching scissor skills. Before starting with scissors, practice pre-cutting activities to build hand-eye coordination and help build the strength of the hand muscles. Pre-cutting activities include playing with large plastic tweezers to pick up objects like cotton balls. Another activity idea is to use a turkey baster or a small plastic syringe to transfer water from one container to another. The key is to make these activities fun and to continue doing them, even after your child starts using scissors. Have your child help, find and prepare the cutting practice sheets and pre-cutting activity supplies. Ensure they help clean up, too! Teach your child that it’s safety first when using scissors. Ensure the scissors fit your child’s hand. Knowing how to hold the scissors is also very important. 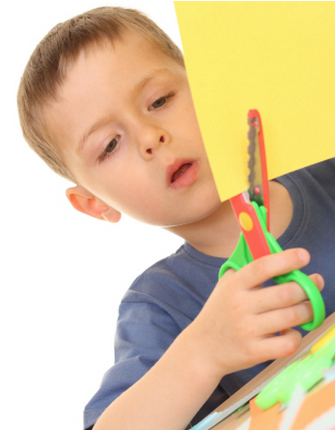 Set your child up for success once you progress to scissors by teaching snips first. Whatever your child snips- paper, straws or string- can be used as part of a larger game, activity or art project. Progress slowly. Practice a lot. Always have fun. Ensure your child does the “work” because children learn by doing. You can tell your child and you can show your child, but if your child actually does the activity with you, they will learn and remember! With 20 years’ experience as an Occupational Therapist working with children with and without disabilities, I have seen parents and children face many challenges performing fine motor tasks, including seemingly simple skills such as using scissors effectively. The key to success when learning preschool skills – including scissor use – is following a proven, step-by-step plan. Every child, including those with a disability, learns faster when they are having fun. Knowing the steps involved in teaching scissor skills accelerates learning, eliminates the frustration of seeing your child struggle and gives you peace of mind knowing that you’re on track in teaching this particular skill while developing your child’s overall fine motor skills. Teach Cutting and Scissors Skills is an integrated learning eBook that includes step-by-step instructions to help a child develop and practise their fine motor skills as well as scissor skills. In addition the eBook provides teaching and safety guidelines, colorful cutting practice worksheets and best practice strategies to make learning how to use scissors fun. The downloadable Teach Cutting and Scissor Skills eBook is filled with step-by-step instructions, cutting practice sheets and tips. This valuable eBook is FREE.